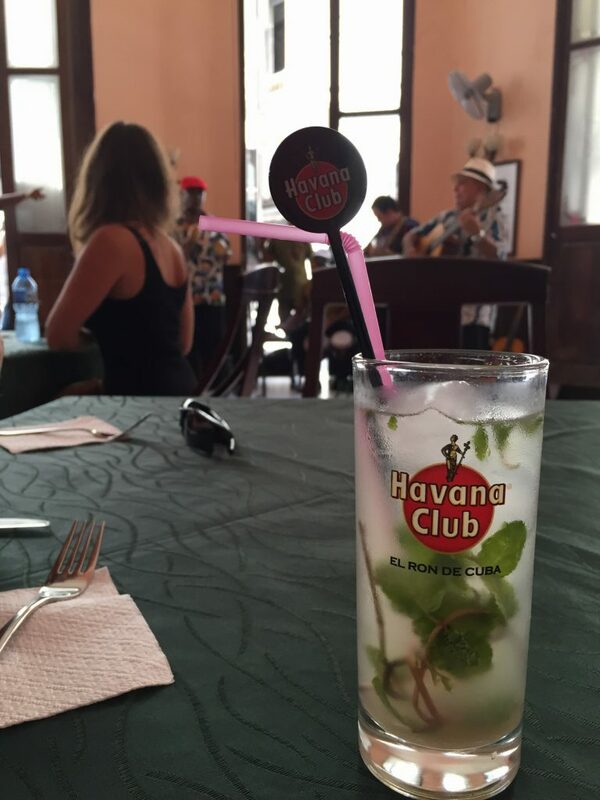 This week we have been in Cuba, and wow, is this place something different! But while there are many wonderful and amazing things about Cuba, the one thing I wasn’t impressed with on arrival was the lack of internet. It wasn’t completely unexpected, but I found out fast that I was ill prepared. I mean even in the remote jungle of Guyana we had occasional drips of internet that allowed simple emails to get out. 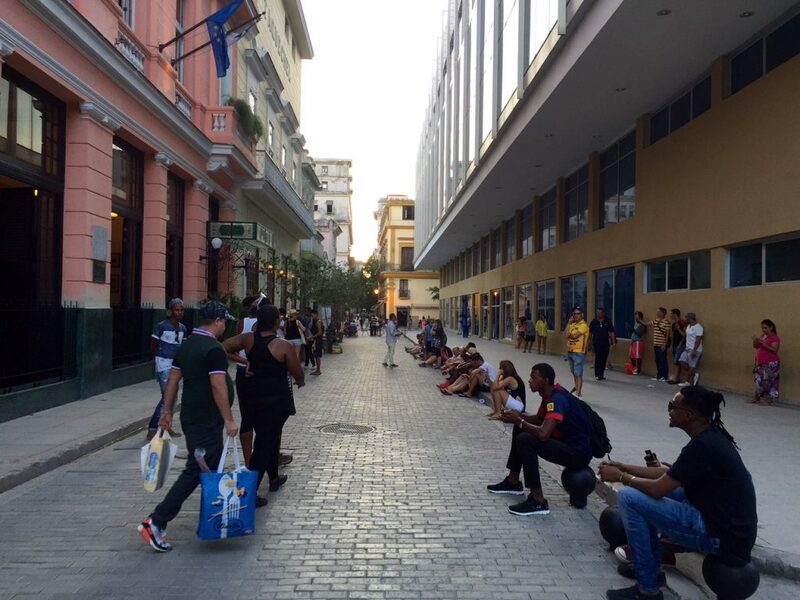 But here in Cuba, with the exception of one hotel that sold expensive wifi and had a crowd of people around it treating each kilobyte like gold, there was nothing. I was in for a big wakeup call! 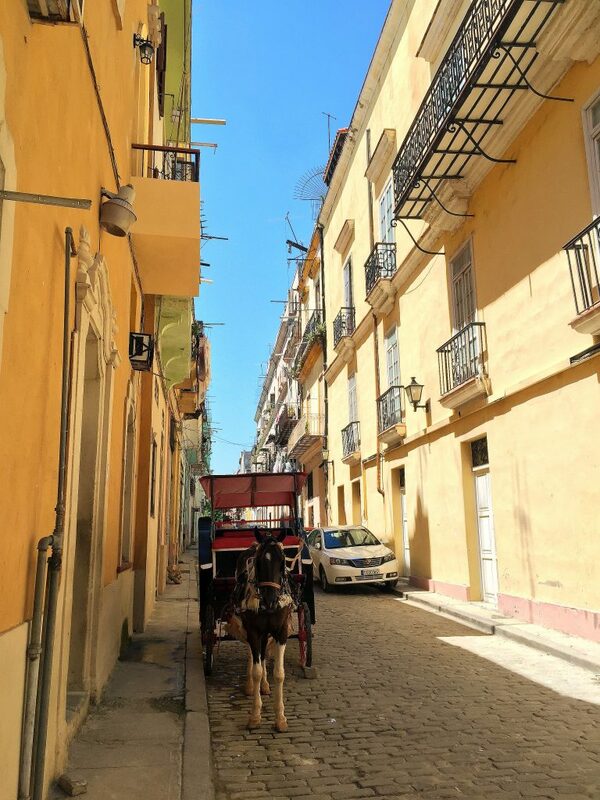 Cuba is in the midst of a transformation with horses and carts still mixing with old and new cars. Internet will be there one day! Being away from the internet is like going cold turkey on a heavy caffeine addiction. The first day was tough. I had posted an article on Abstract Heaven from the departures lounge at the airport about being badly sunburnt and I knew that my parents would be disappointed. I wanted to contact them and let them know I was ok and not to worry. But with no wifi there was no chance for damage control. Lucky for me there were $2 mojitos to keep my stress levels down! If I thought the first day without internet was hard, the second day was hell. 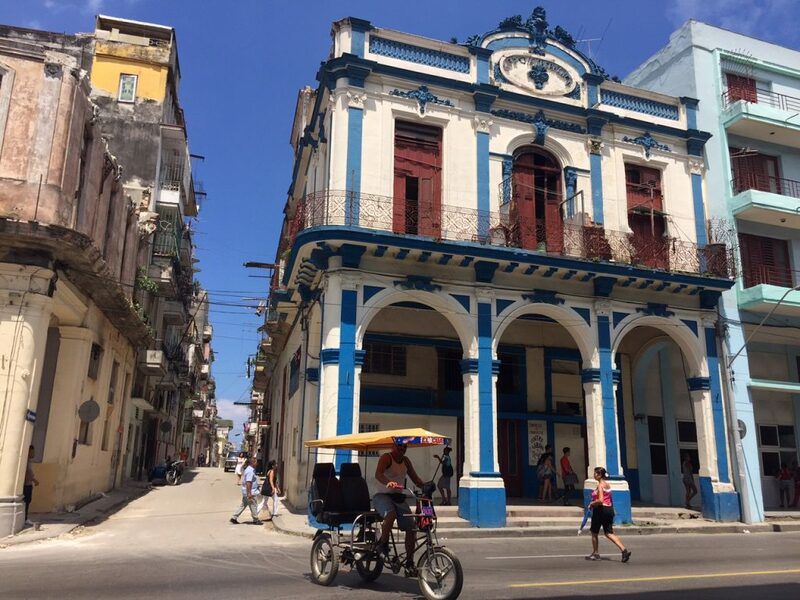 I quickly realised that I knew nothing about Havana. I couldn’t just go to Tripadvisor.com and pull up the top 10 for the city. I couldn’t read through my favourite travel blogs to see where the best local sites are hidden. I couldn’t even whip up a map of the city on my phone! 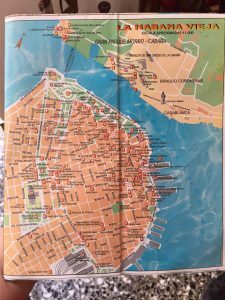 And not only did I not have a map of Havana, I didn’t even know how to get one. I didn’t know where the tourist offices were or even what direction the city was in. Our host spoke only Spanish and her English translator was not around. Thank the lord for my Spanish phrase book which helped me ask our host who then lent us her only map. Thank goodness our host had a map! We now had a map with some basic information, but it was nothing like the information you could get with just 10 minutes online. We weren’t sure where the good (or cheap) food was, we weren’t sure if the park with the unnamed monument was worth walking 2 hours to see. 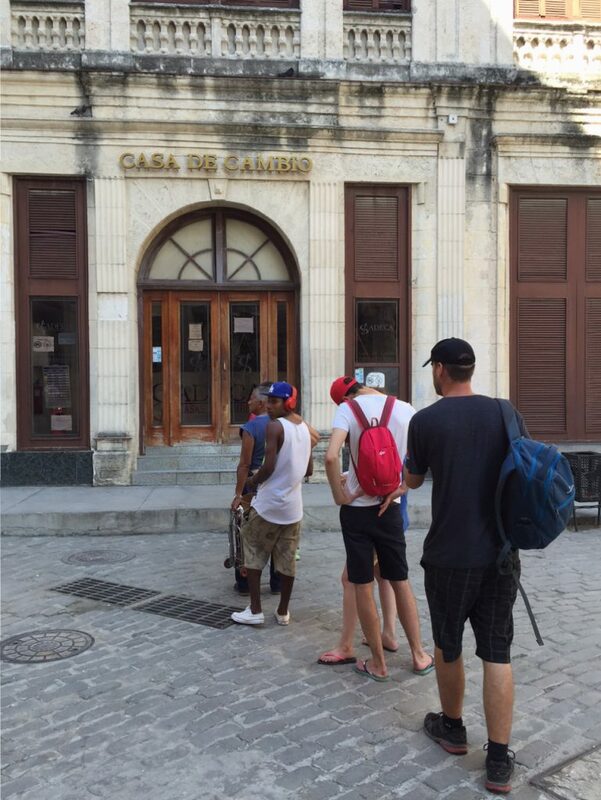 We weren’t sure where to go to change money when we were running low (ATMs are another rare commodity in Cuba), and it was when we were in the long line for the currency exchange that I noticed that other people had guide books. I have long stopped carrying guide books as they take up lots of room and are a weight I don’t need to carry when the information is available online. 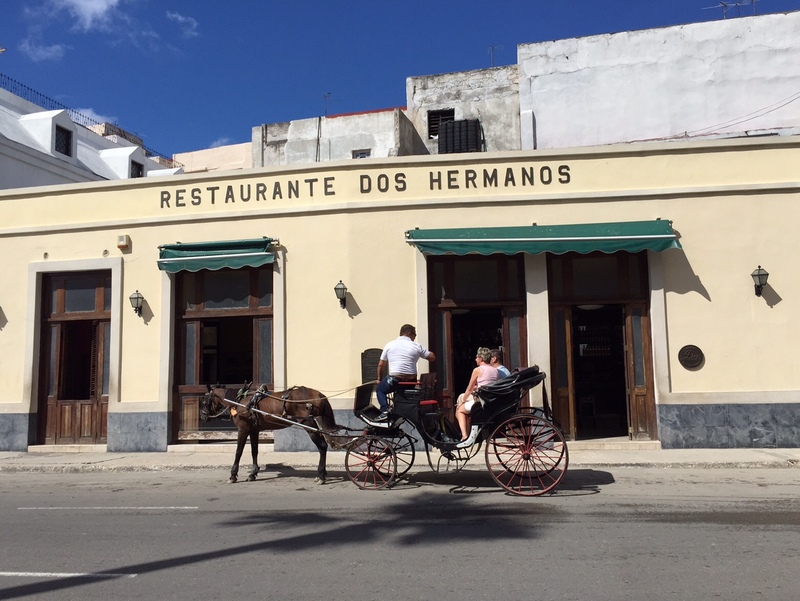 But in Cuba where there is no internet guidebooks are a fantastic way to get information. I just wish I had thought to buy or download one before we left! Once the panic of venturing into the unknown died down a little, I started to realise we were on a bit of an adventure. Did it matter if the mystery monument was just a stairway and a statue? No, because we got to experience so many things on the way! We got to see students going to school wearing interesting uniforms, we got to eat lunch at a hip local burger joint where our whole meal cost less than $5 and we got to see some stunning architecture painted in every colour of the rainbow. And we would never have seen these things had we not gone to the monument. On our last night in Havana we decided to walk home a different way to our usual route. The alley way we chose was lit with street lamps and we found a chocolate shop that sold chocolates in the shape of cigars. 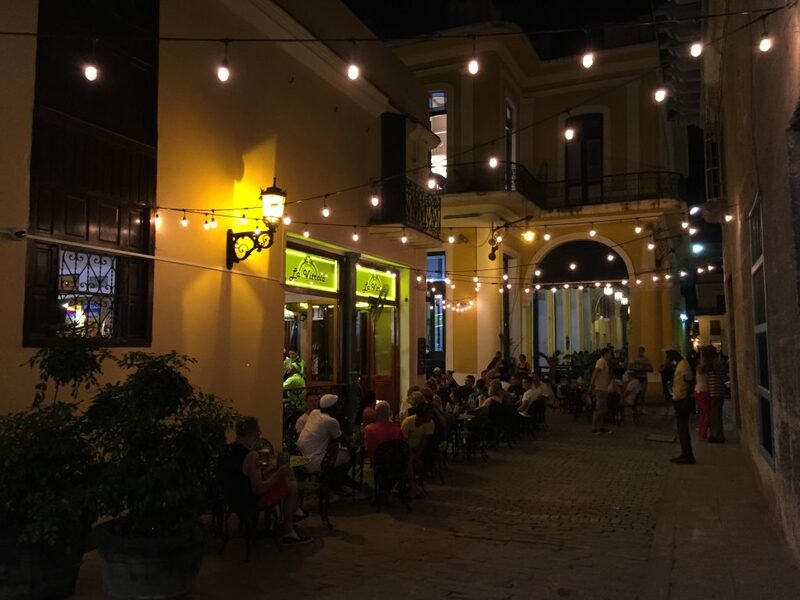 Then the street opened into a beautiful square that was framed by brightly painted buildings with a fountain in the centre and a little restaurant in the corner that was shimmering from the soft glow of fairy lights. The feeling of wonder and surprise that came over me as we walked into this charming plaza was incredible. It was like we had discovered something new, our own secret paradise hidden between alleyways. For all we knew it may have been the top place to go in Havana or it may have been bottom of the list, but as far as we were concerned it was our own private wonderland that we had discovered. It was the top of our list and that’s all that mattered. As the week went on I missed the internet less and less. I sometimes wondered about what people were doing or what was happening in the world but I was no longer an addict trying to find my next fix. And now instead of spending hours looking at screens, Dan and I were talking to each other. We had long conversations about all sorts of things and it is nice to know that we are still so comfortable in each other’s company even after 6 months on the road together. 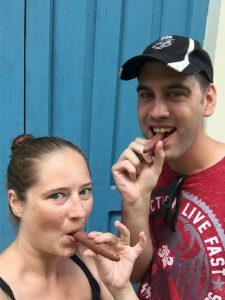 Taking silly selfies with our chocolate cigars! But as I write this on the flight to Mexico City I must admit that I am excited about being reconnected with the world. I want to see how our friends and families are, I want to research our next destinations and I want to tell the world about Cuba. But at the end of the day I know that the internet is not everything. The information it brings may be wonderful but so is the connection you form with the people around you when it is not there. And it’s nice to know that I can always switch it off. I am proud to say I didn’t give in and buy the expensive wifi that had all of these people sitting around and leaning on the wall, desperately getting their fix! I spent a week in Cuba and being disconnected was Great! But like you said, I can live without the internet but I don’t necessarily want to.